Army Staff Sergeant Anthony Cala joined the military out of California in February 2002, with the desire to serve his country and obtain his college education. After being honorably discharged from active duty on November 28, 2011, he joined the Army National Guard the following day, where he is still involved. Staff Sergeant Cala was deployed three times, serving his country for nearly a decade. In 2004, he was injured in an improvised explosive device (IED) explosion, which ultimately resulted in a traumatic brain injury (TBI). Throughout his deployments, Staff Sergeant Cala witnessed many traumatic events and incidents that led to him being diagnosed with posttraumatic stress disorder (PTSD). He also suffers from hearing loss, degenerative arthritis of the lumbar spine, tinnitus, chronic sinusitis, and asthma, in addition to sustaining a right leg injury. 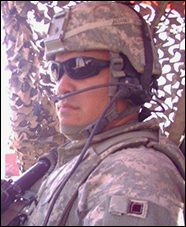 For his service to his country, Staff Sergeant Cala was awarded the Army Commendation Medal, Army Achievement Medal (2x), Army Good Conduct Medal (3x), National Defense Service Medal, Armed Forces Expeditionary Medal, Iraq Campaign Medal (7x), Global War on Terrorism Expeditionary Medal, Global War on Terrorism Service Medal, Army Overseas Service Ribbon (6x), Army Non- Commissioned Officer Professional Development Ribbon, Army Service Ribbon (4x), Combat Service Ribbon (6x), Combat Infantry Badge, Drivers Badge, and the Florida National Guard State Activated Ribbon. Staff Sergeant Cala, his wife Jennifer and their two children received a mortgage-free home in Lakeland, Florida on May 3, 2016.